Notch it up a gear. When we visited the K'NEX stand at the London Toy Fair 2017, one of the toy maker's new ranges that most caught our eyes was the STEM sets. These are designed to get kids building, experimenting, and thinking about how certain mechanisms work... such as gears. 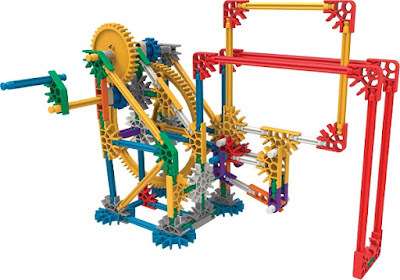 We check out the K'NEX STEM Gears Set. This is a compact and relatively inexpensive set that includes 143 parts. 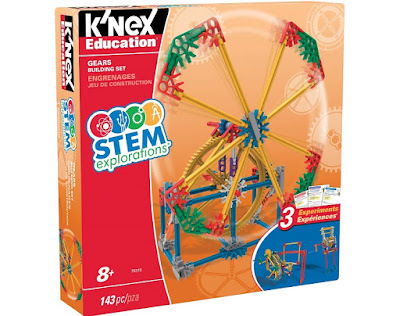 Unlike most other K'NEX which have a definite building goal in mind, such as a roller coaster, blaster, or playset, the K'NEX STEM Gears Set is a bit more vague, as it is all about providing kids with the parts to conduct gear-based experiments. There are instructions, and there is an initial model to construct (the windmill-like build), but this is still the most open-ended K'NEX set we've yet to see. Right, the build. The instructions on this set are very brief, and despite the fact that you are putting together a 143 part model, there are only five or six quite complex steps to follow. Although the set is aimed at ages 8+, this might not be the best first K'NEX to get your child if they have no experience of the system. If they've played with and built some K'NEX previously, no worries. The windmill took about 15 minutes to complete, and once done you have a simple device with a crank shaft, two equally sized gears, and a large 'sail' section. Crank the handle at the rear and the sails will spin. Big deal, eh? Well it is, actually. Included with the set are different sized gears which your kids, once they've had a go on the starter pair, can swap out to modify the model. By exchanging the different gears into the two available positions, they can see how the rotation of the sail section is affected. The instruction booklet then offers suggestions of questions to ask the kids, such as what has changed, and why? All this can then noted down in their experiments booklet, should they have one. 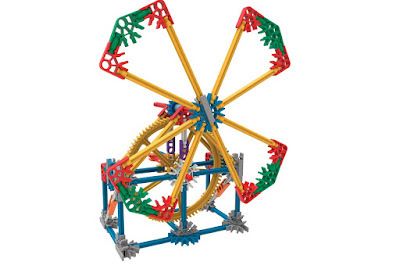 Once the experiment is complete, the windmill can disassembled to build the other two suggested models from the book; both of which also focusing on gear ratios. There are no power functions included in the set, so everything is hand-cranked, but that is useful as kids can actually get a feel for how the change in gears affects the crank. They won't be building anything too complex with this set alone, but should they have other K'NEX parts then the gears could be incorporated to make something bigger a more awesome. At the end of the day the K'NEX STEM Gears Set is a great low-tech introduction to STEM without being intimidating as some coding setups can be. This is a fun yet also educational toy.